Get in touch with nature at Horseshoe Bay and Riesling Trail. Get some historical perspective at North Terrace and St Peter's Cathedral. 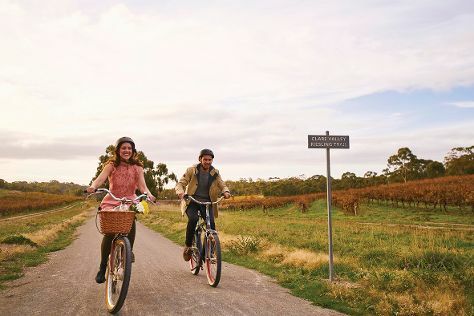 Get out of town with these interesting Adelaide side-trips: Aldinga Beach (in Aldinga Beach), Gorge Wildlife Park (in Cudlee Creek) and Sevenhill Cellars (in Clare). And it doesn't end there: kick back and relax at Henley Beach, glide peacefully along the water with some of the best stand-up paddleboarding in the area, and tour the pleasant surroundings at Glenelg Beach. To find photos, maps, ratings, and tourist information, refer to the Adelaide trip site . If you are flying in from United Kingdom, the closest major airport is Adelaide International Airport. In December in Adelaide, expect temperatures between 30°C during the day and 17°C at night. Finish your sightseeing early on the 10th (Tue) so you can travel back home.